Yamatji Marlpa Aboriginal Corporation (YMAC) Co-chairperson, and Nyiyaparli (central Pilbara region) woman, Natalie Parker, has called on the Prime Minister, Malcolm Turnbull, to attend the 5th Annual Yule River On-Country Bush Meeting next week. Last week, YMAC asked the State Government to release details of its plans to manage funding of remote Aboriginal communities into the future, with its 50-year funding agreement with the Federal Government expiring on Saturday (30 June). The State Government responded on Friday by launching an eleventh hour national public campaign to pressure the Federal Government to “not abandon 165 remote communities in Western Australia”. The State Government said its ‘Don’t Walk Away’ campaign would feature online and print media advertising, and promote a website with a call to action for people concerned about the plight of the almost 12,000 people living in remote communities across WA. “Both the State and the Federal Government need to step up at Yule River on 11 and 12 July and let people from remote Aboriginal communities know what is happening,” Ms Parker said. “Aboriginal people across WA, including in my community at Youngaleena, are looking over their shoulders, and face the trauma of being forced off their Country again. YMAC Chief Executive Simon Hawkins said both governments should demonstrate respect for the health, wellbeing and safety of all Aboriginal people living remotely in WA, by bringing a sustainable plan to fund remote communities to Yule River. “YMAC understands the deep cultural and spiritual value that living on Country holds for many Traditional Owners; allowing them to practice traditional Law and customs as recognised under their native title determinations,” Mr Hawkins said. 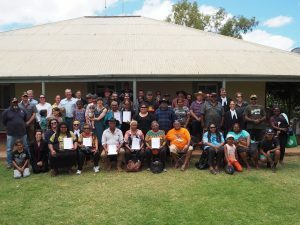 The Budina community is today celebrating the legal recognition of their land and culture at an on-Country Federal Court hearing at Lyndon Pastoral Station. 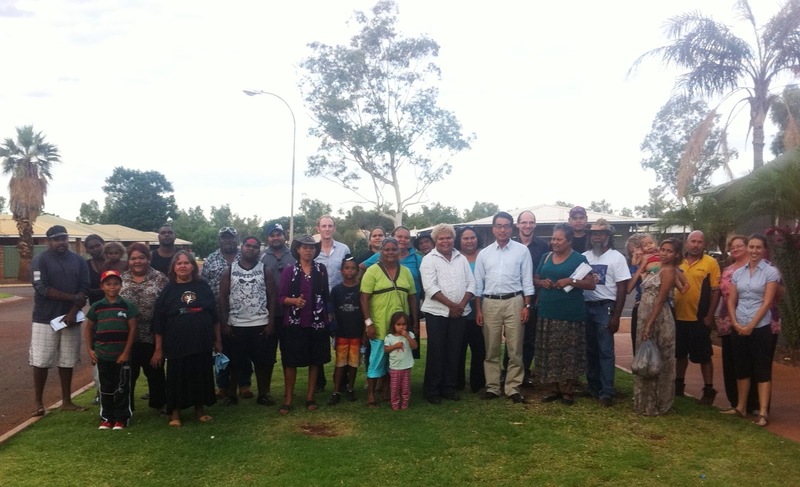 The event was co-hosted by Yamatji Marlpa Aboriginal Corporation (YMAC) and Budina Aboriginal Corporation (BAC). The Budina are a small but close community who have continuously maintained their association with Country. The Budina People continue to look after their Country and pass on cultural knowledge through traditional law and traditional customs. His Honour Justice Griffiths congratulated the parties involved in the native title determination process. Yamatji Marlpa’s CEO Simon Hawkins was featured in the recently published The Miners – Stories from the industry that drives modern Australia, by Barry Avery. The 1992 event that has become known as the Mabo Decision changed the landscape of mining and exploration in Australia forever. This was a landmark High Court ruling that recognised the legal concept of Native Title for the first time, rejecting the previously held doctrine of terra nullius. It gave the Indigenous traditional owners certain legal rights to their land. The Yamatji Marlpa Aboriginal Corporation (YMAC), of which Simon Hawkins has been chief executive for the past decade, is an organisation that represents 25 Aboriginal cultural groups across the Pilbara, Murchison and Gascoyne regions of Western Australia – including dealing with Australia’s major resource developers with respect to Native Title claims. Hawkins explains that recognition of Native Title does not give a veto over mining or development, as traditional owners cannot stop mining from going ahead. What it does give these groups is a right to negotiate, allowing development to go ahead while claims are being resolved. ‘This gives traditional owners a seat at the table – to have a say about how mining will unfold on their country,’ he says. L-R: Greg Knox (Top Iron), Nick Revell (Top Iron), Badimia Traditional Owner Frank Walsh Jnr., Bruce Richardson (Top Iron), Kevin Stemp (Top Iron), with YMAC claim lawyer Paul Avina. The Badimia People, Traditional Owners of land in the Midwest region of Western Australia, are pleased to announce they have entered into an agreement with Top Iron Pty Ltd. The agreement paves the way for the iron ore miners to develop their Greater Mummaloo Project in Badimia country, near the existing Extension Hill project. The Badimia people will benefit from preferential contracting opportunities and employment targets on the project, as well as financial compensation linked to the project’s production. The company has also agreed to hand over all housing units and light vehicles to the Badimia people at the end of the project, further enhancing opportunities for Badimia businesses. The agreement also includes several provisions to protect and promote Badimia culture and heritage, including heritage survey protocols, Badimia cultural awareness workshops for Top Iron employees, and avoidance of certain areas that are important to Badimia cultural heritage. Badimia working group member Frank Walsh Jnr. said of the agreement, ‘Badimia people have once again shown that they can reach agreements like this with mining companies in our region and that we are quite supportive of those companies who totally respect and understand our Badimia people and culture. ‘At the end of the day it is about empowering our people and communities. The financial aspects of these agreements are important, but the economic and employment opportunities, as well as heritage protections that arise out of these agreements, are also very significant’. 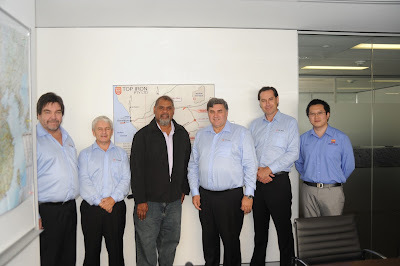 Yamatji Marlpa Aboriginal Corporation (YMAC) CEO Simon Hawkins said, ‘The agreement was reached swiftly, after Top Iron made efforts to develop a positive relationship with the Badimia people before the formal negotiations began. ‘The company made an effort to understand the community’s aspirations and concerns, so the negotiations went very smoothly and only took two formal meetings. This has laid the foundations for a good relationship between both parties for the future of the agreement’. The Yinhawangka people recently announced a native title agreement with Dragon Energy, paving the way for its flagship Pilbara Iron Project. Under the agreement, Yinhawangka consent to all activities associated with the development of an iron ore mine at Dragon’s Rocklea Central and North deposits. It also allows for further mining leases within the area. The Agreement follows 12 months of constructive consultation and covers milestone and production payments, employment opportunities as well as cross-cultural exchanges and consultation on environmental matters. Yinhawangka representative Roma Butcher said, “It was a pleasure doing business with Dragon Energy. Dragon’s General Manager Gang Xu was so easy to talk to and clearly has a huge respect for Yinhawangka People. “I feel that Dragon worked with us respectfully and understood things we had to say about the Country, the flora and fauna, and how these things are important for us, our community and our health. Dragon Energy had empathy for what we are trying to achieve, and that meant that in return we also wanted to work with them. Maybe some of the Chinese cultural values that Gang Xu brought to our meetings were similar and led to understandings of our Aboriginal culture. Dragon Energy’s Managing Director, Mr Gang Xu, commented that the parties had developed an excellent working relationship and looked forward to this continuing with the development of Pilbara Iron Project. “Our negotiations with the Yinhawangka People have been based upon a strong mutual respect and have focussed on achieving outcomes that will benefit of both parties. The Ngarlawangga native title group today announced the signing of an agreement with Montezuma Mining Company Ltd (Montezuma) for the Butcherbird manganese project over 23,000 hectares of their traditional country, south of Newman, as well as consents to future mining in the area. 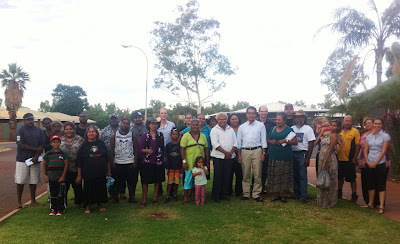 The agreement has seen Traditional Owners and Montezuma develop a framework for how they will continue working with each other, including assisting Ngarlawangga people into employment, agreed processes and timeframes by which heritage clearances will take place and support for tendering for new contracts for community businesses. 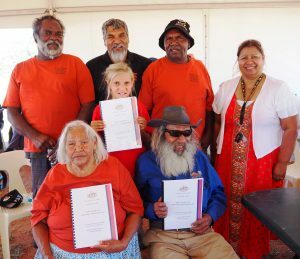 The signing includes an agreed process should the mining company apply for permission to disturb heritage sites, which provides both parties with a guaranteed consultation process under the Aboriginal Heritage Act (WA). Yamatji Marlpa Aboriginal Corporation (YMAC) CEO Simon Hawkins said, “Montezuma listened and responded to the community’s needs throughout the process. In turn, the Ngarlawangga people were able to reach agreement quickly, giving the company certainty. Both parties are particularly focused on supporting new and existing Ngarlawangga contracting companies to benefit from this project, including incentives for community businesses”.